Mega Bloks First Builders Food Truck Kitchen Building Set Just $21.66! Was $40! You are here: Home / Great Deals / Amazon Deals / Mega Bloks First Builders Food Truck Kitchen Building Set Just $21.66! Was $40! You can grab this Mega Bloks First Builders Food Truck Kitchen Building Set for just $21.66 right now down from $40!! For comparison, Walmart has it for $39.99. Roll out a tasty transformation with the Food Truck Kitchen by Mega Bloks! 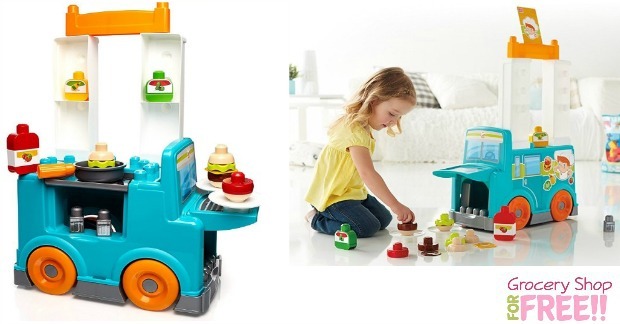 With two ways to play, this big, rolling truck opens into a stand-up kitchen where your little foodie can build all kinds of yummy curbside treats. Open the side window to reveal a stovetop for your frying pan. Next, open the roof to build a pantry where you can keep your ketchup, mustard and relish. Then, lift up the front grill, and start flipping your patties. Don’t forget the salt and pepper! Stack all your ingredients to make a giant hamburger, or make two and use the plates to share with friends. Use the parts to build your snacks any way you want, learning self-expression along the way. When the kitchen closes for the day, put everything away inside the truck until your next gourmet pit stop! Ideal for ages 1 to 5.